Dangerous Games: What the Moral Panic over Role-Playing Games Says about Play, Religion, and Imagined Worlds. University of California Press. Available from Amazon and iTunes. The 1980s saw the peak of a moral panic over fantasy role-playing games such as Dungeons and Dragons. A coalition of moral entrepreneurs that included the Christian Right, psychologists, and law enforcement claimed these games were not only psychologically dangerous but an occult religion masquerading as a game. Dangerous Games explores both the history and the sociological significance of this panic. Fantasy role-playing games do share several functions in common with religion. However, religion—as a socially constructed world of shared meaning—can also be compared to a fantasy role-playing game. In fact, the claims of the moral entrepreneurs, in which they presented themselves as heroes battling a dark conspiracy, often resembled the very games of imagination that they condemned as evil. By attacking the imagination, they preserved the taken-for-granted status of their own socially constructed reality. Interpreted in this way, the panic over fantasy-role playing games yields new insights about how humans play and together construct and maintain meaningful worlds. 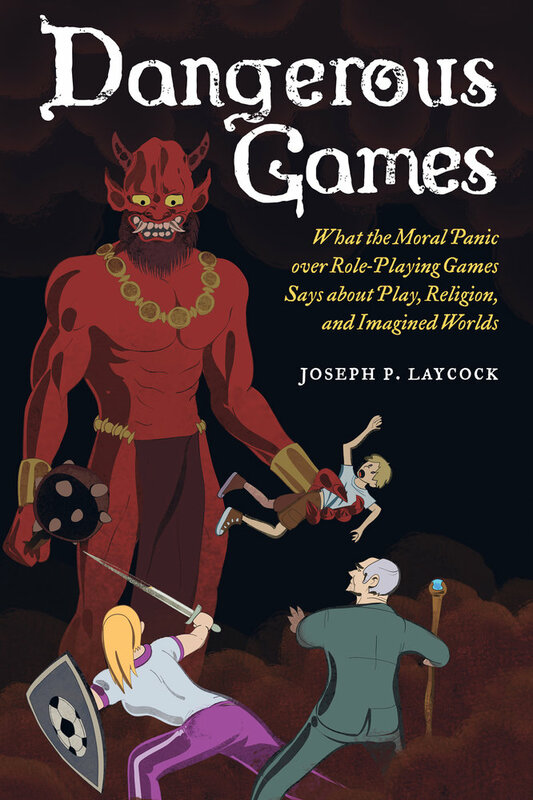 Laycock’s clear and accessible writing ensures Dangerous Games will be required reading for those with an interest in religion, popular culture, and social behavior, in the classroom and beyond. Nova Religio 21:3 (February 2018). Black Gate Magazine (May 28, 2016). Geek's Guide to the Galaxy Podcast (January 8, 2016). Times Higher Education (May 14, 2015). "Back to the 80s Because We Never Left them," Slacktivist Blog (May 28, 2015). The Chronicle of Higher Education Weekly Book List (March 27, 2015). LA Review of Books, Marginalia: (June 23, 2015). Amina Inloes, "A Muslim Reflection on Dangerous Games," The American Journal of Islamic Social Sciences 33:3 (2016): 138-149.